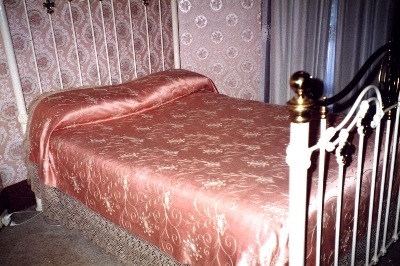 Hand embroidered pink silk quilt with white embroidery. Wide border of hand made lace thought to be French late 18th century. Cream silk backing and very thin padding. The quilt was held by a family in England who brought it to Australia c.1950. It was acquired by the present owner from this family. 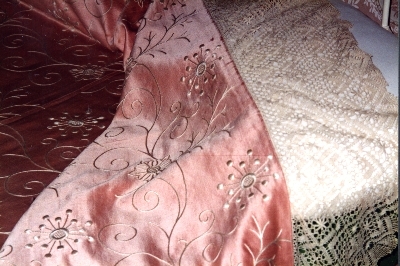 Wholecloth pram quilt with a top of pink cotton sateen, and the reverse is a more finely woven, ivory, fabric. All over quilting design as main feature, with stylised hearts, leaves and cross hatching. The padding is cotton batting. 870 x 660 mm. Hand stitched, cotton, appliquéd, quilt in a flower pattern on a plain background. Colours are shades of green, apricot and browns. This quilt was known as a 'Bride's Quilt'. Padding is thought to be layers of white fabric raised almost like a wadding. The backing is cotton material. 2470 x 2020 mm. Wholecloth quilt. Quilting pattern is a large 'feathered thistle' with thick stem, as the main design feature. The border is a combination of straight and curved parallel lines. Burgundy sateen with damask weave. All quilting is handstitched. Padding is cotton wadding and backing is tomato red cotton. 2150 x 1820 mm. Wholecloth quilt with white cotton centre, sky blue cotton border and dark blue binding. There are 9 repeat designs of cross stitched flowers and leaves in the centre section. Around the blue border there are 18 cross stitched flowers. Blue on blue and white on white cotton quilting of diagonal lines and curls pattern the quilt. The backing is white cotton and there is a very light padding. "This all white quilt has a front face of fine white plain weave cotton. The quilt is lined with brushed cotton twill. The two layers are quilted with white cotton thread across the entire surface with rows of zigzag stitching 16-20mm apart.